Entry #4 calling for votes! But hurry please, cos voting ends September 9th, you see. Come one, come all, drop me a vote for the sake of entertainment! Please, please, please go to Hochiak! Delicious Asian Food and vote for me in the USD100 giveaway contest! The assam, the laksa & …? 13 Responses to Entry #4 calling for votes! Will keep on trying though! Hope you win! The Giddy Tigress says: Thanks for the vote! The Giddy Tigress says: Didn’t win, but you still want a taste anot? Thanks for the vote, bro! The Giddy Tigress says: Hehe, thanks! Sure thing! Gingeoyce, I voted for you! You’re in 3rd place, pretty close, better post a note on Facebook, tell all your colleagues and family! The Giddy Tigress says: I forgot to do that Preets! But thanks for the vote! Now when do we eat? The Giddy Tigress says: I think voting closed liao leh. Oops sorry, voted for Wen already! 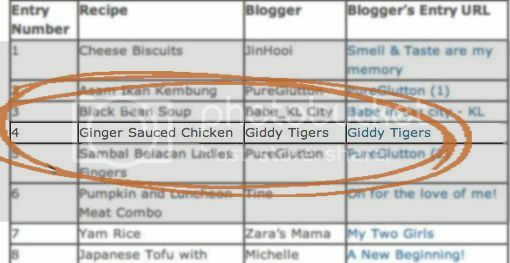 The Giddy Tigress says: Aisay, it’s okay la….wait for the next contest I enter okay? The Giddy Tigress says: IE also can vote what….but contest closed liao now. The Giddy Tigress says: It’s okay. I WAS 3rd, but not in the final standings!